I could eat the dish you see before you thrice weekly for the rest of my days. In my eyes, the good luck it's supposed to bring is just a gratifying bonus. Black-eyed peas. In their unseasoned and unflavored state, there's certainly nothing spectacular or special about them (other than their tell-tale periorbital hematomas)(yeah, I said it). However, there are a few key components that were added to this particular batch that make them utterly irresistible (I've eaten them for four days straight). What could these magical ingredients be, you ask? Cilantro and ham hock. Cilantro is hands-down my favorite herb, so I'm sorry for those of you who find it revolting. It contributed a wonderfully fresh and vibrant flavor to the peas. Further, the inherent yumminess of the ham hock managed to seep into every single pea as they simmered on the stove and resulted in a slightly salty, oh-so-tender and rich mess o' legumes. I ate mine over some toasted sourdough drowned in pepper jack cheese (and felt warmer than I had for days). Cumin and dry mustard were also involved, but to a lesser extent--their notes were subtle but definitely appreciated. All in all, this was just a masterful dish that hit all the right spots. Comfort food, defined. Place black-eyed peas in a large pot. Cover with enough water to be about 2-inches deep over peas (anywhere from 6-8 cups). Bring to a boil, boil for 3 minutes, and remove from heat. Cover and allow to sit for 1 hour. Drain water off of black-eyed peas. Add the liquid, ham hock, cumin, mustard, salt, and pepper to the black-eyed peas and bring to a boil. Reduce the heat and cook, covered, for about 1 hour, or until the peas are tender, stirring occasionally. To finish, stir in the chopped cilantro and serve over some nice, hearty bread. Oh, YUM! I eat mine with corn bread! I've never tried cilantro with them, but in my taste imagination that's a great combo. My only problem with all this is that YOU CAN'T FIND BLACK EYED PEAS IN BELGIUM! Sorry for shouting. I have to bring mine back from the US when I visit. Luckily, they're not heavy. Oh yum, ham hock and legumes, Grace you're definitely speaking my language. They look very more-ish, I suppose they have to be if you've had them 4 days straight! Will definitely bookmark this for winter. it says a lot if you can have them so many times a week! heh. i love peas. looks like awesome comfort food. yum. Very yummy! Those peas are fantastic! I am on a big bean kick right now, and have never thought of eating them this way. Also, anything with a ham hock is a ok in my book. They look like they would warm you up on a cold day like today! I love mine with good old southern fried cornbread! Grace, this is what we southerns call ~ GOOOOOOOD EATING! I could go for a serving right now. I had black eyed peas for the first time this year..what can I say, I am not from the South! They were wonderfully delicious and I must say that this sounds even better! Cumin is one of my favorite seasonings to use! This dish looks delicious. oo ham dock does add plenty of flavours to a dish...looks so good! Would you hate me if I admitted I've never made black eyed peas in any form? This dish looks really delicious, though, and your description of all it's scrumptiousness just might change my mind. These look like very lucky black-eye peas and very delicious ones too. I love a good smattering of cilantro on beans! YUM! I really need to try black eyed peas - can you believe I never have? This recipe is perfect for me because cilantro is my favorite herb too. Looks delicious Grace, as usual. never heard of this, but I am a foodie and will easily dig right in, no prob. I am slapping my forehead just like the V-8 commercial. Duh! Love black eyed peas. Love cilantro. Never mixed them before!!!! I'm loving the looks of this dish, Grace- ham with any dried bean or pea is top notch in my book! I can eat tem reheated for days too. My late grandmother's second stepmother (I know - complex) was from North Carolina, and we always ate black eyed peas on new years day. It was considered very strange in Connecticut. I make beans in a very similar way (but not with black eyed peas). Great tongues taste a like! Black eyed peas I must confess are not my favourite cup of beans. However this recipe made me pause and got me thinking I've got to try this! I love the cilantro idea, very nice. I've never thought about pairing black eyed peas with cilantro, either. I'm going to have to try it though. Though my mom cannot even be in the same room as cilantro, i've somehow developed a strong obsession with the yummy herb! I would love to get my hands on some of this comforting goodness! can you believe I've never had black eyed peas before? I'm curious about their texture - is it similar to the texture of lima beans? I love cilantro too! I can't believe that I have never cooked black eyed peas. I had 2 ham hock this season and I just made black bean soup with one. Now is my chance to make black-eyed peas with the other. 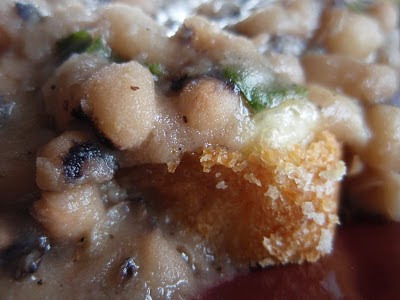 Like another reader commented, I've never had black-eyed peas either! (Crazy, right? ;) ) I do love most legumes that cross my path -- all in fact, except fava beans. I bet I would love this, it looks so warm and comforting! We NEVER celebrate a New Years without our blackeyed peas. Traditionally, when I was growing up in TX , we always had them at midnight on NY Eve. I've done that for many years and have converted many people who had never eaten black eyed peas before. We did it when we lived in NY and now we serve them to our friends here in California. Cheese and ham would take these over the top Grace. You got me at the ham hock. Isn't everything better with pork? Any kind of pork? I made this recipe with some minor adjustments. I really wish I had doubled the recipe it was SO GOOD! I couldn't stop thinking about it after dinner and was still thinking about it as I fell asleep last night. I used frozen peas, so no soaking and I cut down on the water. I cut back on the cumin and mustard to 1.5 tsp each. I added Bacon Salt and a little bit of Cayenne (I'm Cajun, it's required). The peas were so good, I literally couldn't stop eating them to add the cilantro...and I LOVE cilantro. Thanks for the inspiration for the seasonings Grace. I love a black-eyed pea and I've always been happy with the way I cooked them, but now I have a new recipe! I don't know how people can be turned off by cilantro. I love it too, Grace. Looks like you are gonna have a very lucky 2010! I'm going to try this. I made black-eyed peas once, last year on New Year's Day, and the recipe I followed was, shall we say, well... did not yield tasty results. In fact is was enough to swear me off black-eyed peas (for what I thought might be) forever. But this looks and sounds delicious & easy too. There isn't an extra ingredient used that I don't love the flavor of---and serving it alongside sourdough or corn bread is twice as appealing. I have done the same thing, eaten these peas four days straight!! I will have to try adding the cilantro. I am sure that it will add some great flavor! I love black eyed peas, We have a delicious dish in Colombia with rice, coconut milk and this delicious peas. Oh Grace, these sound delicious! I've GOT to try them. and I don't get cilantro hate? It's my favorite herb as well. I like it mixed in scrambled eggs with sharp cheddar and topped with salsa. I could eat your version three times a week as well.YUM! This was a dish that only peasants enjoyed in the past....and let me add that peasant food is the most enjoyable, lip smacking cuisine that one could consume! !I say this because I am a peasant! Luck will indeed follow you around all of 2010, simply because it is said to be magic beans. Great stuff here! The cilantro is a nice touch. I made a double batch of black-eyed peas on New Year's Day and it wasn't nearly enough. Think I'll put them on the menu this week too. Wow that is a winner for sure. My husband is from the south and loves his beans! and I happen to have a ham hock in the freezer! This is our happy new year dish every year. Unfortunately no cilantro since I eat this dish with cilantro haters- BOO! I heart cilantro! I fall into the Ina Garten category where cilantro tastes more like soaplantro! Its not a matter of hate, btw. There were scientific tests done in a study indicating it is purely biological! Ham hock makes everything better! Cilantro is def. Paul's favorite herb, but not mine. When I was pregnant it made me sick. Funny uh? But now I can eat it. And I'd eat ANYTHING you'd cook! How are you Grace? Happy New Year! I'm all over the cilantro and the ham hock. Seriously. 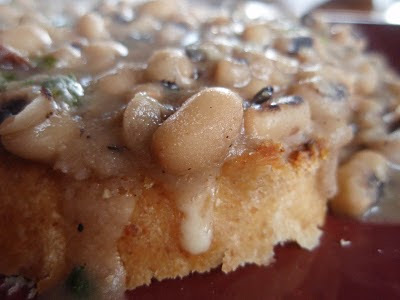 Last year (yes, it's been that long...) when I made black-eyed peas the recipe was a bit meh. This one sound so delish. Maybe a bit o' Sriacha in that? Looks wonderful Grace I can well see why you ate in three days in a row yum! Drowned in pepperjack cheese, that sold me alone. It looks WONDERFUL, Grace! Id love to eat this thrice weekly also. Hook me up, willya? I don't think I've had black eyed peas before or are they bean my mom puts in that one rice dish? Hmmmm. I'm not sure now as I don't know it's English name. Sorry, never mind. I'd say after four straight days of eating this it must be better than good! Black eyed peas sound so good prepared with ham hock, an awesome recipe! I'm definitely in a bean kinda mood lately. Love me some black eyed peas! 2 cups cilantro? Wow, you do like it! This looks like ultimate comfort food. Warm and delicious. While cilantro is not my favorite, I think I would love this recipe with the cilantro toned down where my hubby would love the full amount. This sounds like an addictive recipe. My husbands family always eats black eyed peas on New Year's day. He and his brother joke that it has brought very little good luck! At any rate, I have been thinking of starting the tradition myself, and your recipe looks perfect. I love your descriptions of the flavors and textures of this dish, Grace. I never eat black eyed peas. I need to try them! I've never had black eyed peas and I love cilantro, so I definitely have to try this! I can't remember the last time I had black eyed peas. But now I want some ! My, my, do those peas look good. I see black-eyed-peas on a daily basis. We serve them at the restaurant I serve at. I loved them with the ham hock when I made them for New Years but I never thought of cilantro and incidentally (must be my word of the day) I LOVE cilantro. I could put it on anything. And I love the seed too- which is what I think suckered me into Indian food. Lots 'o' coriander and cilantro. Just went to this all-pork dinner at a restaurant. One of the highlights was this Italian version of cassoulet filled with all sorts of pork parts. The best part, though, was probably the beans. They had cooked in the long-simmered stew and soaked up all that rich, porky goodness. Who knew beans could taste so incredible? Love Black Eyed peas with cilantro! I thought I was the only one who did this, nice to learn I am not. Your recipe sounds great, and never thought to add cumin either. Have got to try this. Thanks for sharing your great recipe and info. who's up for a game of chess?